A vibrant, premium quality 100% cotton T-shirt with unique Albert Einstein artwork on both the front and back of the T-shirt. Made with love in Thailand by Mirror for Amazonas Gifts Brand - Mirror Colour - White Size - M - 70cm x 52cm, L - 73cm x 54cm ..
A vibrant, premium quality 100% cotton T-shirt with unique Bear and the Tree of life artwork on both the front and back of the T-shirt. Made with love in Thailand by Mirror for Amazonas Gifts Brand - Mirror Colour - White Size - M - 70cm x 52cm, L - 73cm x 54cm ..
A vibrant, premium quality 100% cotton T-shirt with unique Bob Marley artwork on both the front and back of T-shirt. Made with love in Thailand by Mirror for Amazonas Gifts Brand - Mirror Colour - Purple Size - Only available in Large sizeM - 70cm x 52cm, L - 73cm x 54cm ..
A vibrant, premium quality 100% cotton T-shirt with unique Bob Marley artwork on both the front and back of T-shirt. Made with love in Thailand by Mirror for Amazonas Gifts Brand - Mirror Colour - White Size - Only medium size left in stock M - 70cm x 52cm, L - 73cm x 54cm ..
A vibrant, premium quality 100% cotton T-shirt with unique Bob Marley artwork on both the front and back of T-shirt. Made with love in Thailand by Mirror for Amazonas Gifts Brand - Mirror Colour - Blue Size : Only available in MediumM - 70cm x 52cm, L - 73cm x 54cm XL - 76cm x 56 cm..
A vibrant, premium quality 100% cotton T-shirt with unique Bob Marley artwork on both the front and back of T-shirt. Made with love in Thailand by Mirror for Amazonas Gifts Brand - Mirror Colour - White Size - M - 70cm x 52cm, L - 73cm x 54cm XL 76cm x 56cm ..
A vibrant, premium quality 100% cotton T-shirt with unique Buddha and the Flower of life artwork on both the front and back of the T-shirt. 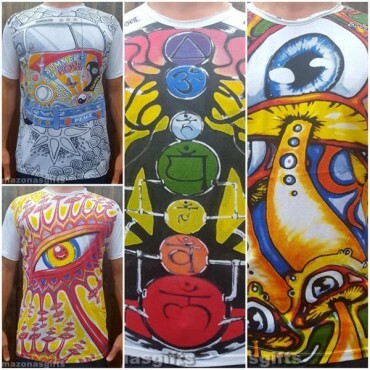 Made with love in Thailand by Mirror for Amazonas Gifts Brand - Mirror Colour - White Size - M - 70cm x 52cm, L - 73cm x 54cm ..
A vibrant, premium quality 100% cotton T-shirt with unique Buddha painting artwork on both the front and back of the T-shirt. Made with love in Thailand by Mirror for Amazonas Gifts Brand - Mirror Colour - White Size - Only have Medium left in stock M - 70cm x 52cm, L - 73cm x 54cm ..
A vibrant, premium quality 100% cotton T-shirt with unique Che Guevara artwork on both the front and back of the T-shirt. Made with love in Thailand by Mirror for Amazonas Gifts Brand - Mirror Colour - Blue Size -Only have medium size left in stock M - 70cm x 52cm, L - 73cm x 54cm..
A vibrant, premium quality 100% cotton T-shirt with unique Third eye/Allseeing eye artwork on both the front and back of the T-shirt. Made with love in Thailand by Mirror for Amazonas Gifts Brand - Mirror Colour - Purple Size - M - 70cm x 52cm, L - 73cm x 54cm..
A vibrant, premium quality 100% cotton T-shirt with unique Eye artwork on both the front and back of the T-shirt. Made with love in Thailand by Mirror for Amazonas Gifts Brand - Mirror Colour - White Size - M - 70cm x 52cm, L - 73cm x 54cm ..